You can’t ever escape insects in the garden. Sure there are many more in the spring and summer, but the fall and winter still has some suckers that sneak up on you. And if you don’t watch them, they can destroy a crop in a week. Trust me, I know. 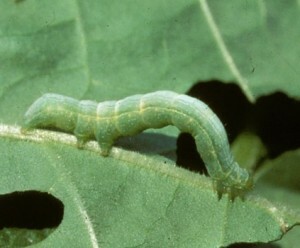 The one that seems to come either with the plants when you buy them at the store or show up the day you plant is the Cabbage Looper. Basically, he’s a fairly small green worm. Here’s a close up of this brat. They start out a quarter of an inch long and get up to about an inch and a half. My Texas Bug Book says they form a loop when they walk, so that’s why they’re called loopers instead of worms. The kids develop into a brownish gray moth with a silvery spot in the center of each wing. They fly at night (great) and lay single eggs on the top of the leaf. When they hatch, they hit the underside and start chewing. The book says to hand pick them off or, if you get a big infestation, try plant oil (i.e. orange oil) spray. 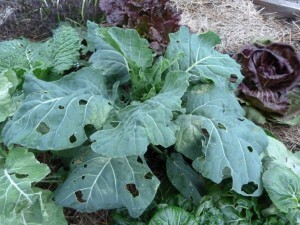 This is the damage they are causing on my plants. 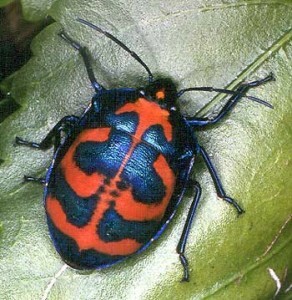 The other problematic bug is the Harlequin bug. These guys destroyed my entire Brussel sprout crop in 5 days. It was cold and I didn’t go out in the garden very much. Big mistake. They took over quickly and I could never keep up with them after that. And they stay through the spring. From a distance they look more like lady bugs, because they are red and black, but do not be fooled! They start by laying 10 eggs (in two rows of 5 eggs each) on the underside of the leaf. The eggs are easy to spot as they are black and white. So you get 10 babies for every mother. Not good odds. The best thing to do is hand-pick the eggs and adults off and either smash them or throw them in a bucket of water and drown them. The book says you can try citrus oil sprays, too. I don’t believe them. Well now you know what to look for in the garden this winter. Now let’s finish up the rest of The Funny Farm tour for December. Again, this has been a bust. I’ve got some Black Seeded Simpson lettuce, a few heads of romaine, some lousy looking beets, a couple of other lettuces and carrots. Actually, the carrots look pretty good. I don’t think it had to do with the Square Foot Gardening, I think my dirt isn’t happy. 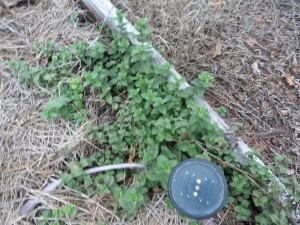 I still don’t know why I listened to My Former Friend and planted mint in one of my beds. It took the entire thing over and I pulled for days to get it all out. Now I discover it’s coming back again and, obviously, it doesn’t mind the cold weather. Grrrr. Well that’s the December wrap up of The Funny Farm. 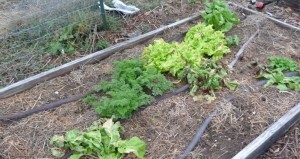 Maybe next month I can show you some produce. Sure hope so. I get so happy when I roast my own broccoli. Are you ready for Christmas yet?